Barbie Blossom Phone Caller ID Telephone. 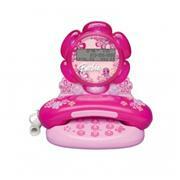 Girls can catch up with their friends in style with this cute and colorful telephone, featuring a bright pink hand set with comfortable rubber grips, bubble gum pink base and sparkled number display. The fabulous design is matched with cool phone features including a gemstone fun button which activates a Barbie melody ring tone and a flashing light in the Barbie flower frame for those important incoming calls. The Barbie Blossom Phone Caller ID Telephone features 64 number caller ID memory, last number redial function, tone/pulse switchable dialing and selectable display language (English/French/Spanish.) Message waiting function and caller ID display are available through subscription service from local phone company.